Portraits capturing various human emotions and thereby being one of the key motifs have been created by painters for a long time. Among them we selected faces of ones wanting to say something, having no feeling without substance and showing strong presence. Takao Ono has been painting portraits with his distinctive technique by temperas. He has been residing in Italy since 1971 while pursuing his academic studies and restoration works. He graduated from the Institute Centrale di Restauro di Roma in 1980. 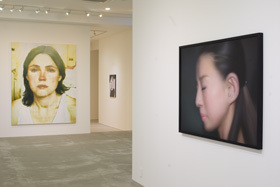 He has participated in several group exhibitions at Shiseido gallery and recently opened his solo exhibition at Ikeda 20th Century Museum of Art in 2008. Takashi Nagase received a MFA in Oil Painting at Tama Art University and the Fukuzawa Ichiro Prize in 2002. He also acquired the Tokyo Wonder Wall Wining Prize in the same year. His works have been introduced in domestic and overseas art fairs. Women with their hair painted strand by strand by an air brush let viewers feel the transmitting warmth of human nature. Satoko Nachi exploring on large-scale canvas the expression of her thoughts and emotions derived from real incidents lets us share common human perceptions through her portraits. She received a BFA at Nagoya University of Arts. In 2008 her works were introduced by “Project N” at the Tokyo Opera City Art Gallery and she also participated in a group exhibition at the Contemporary Art Museum Kumamoto in 2009. 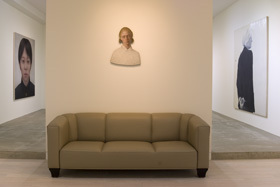 We exhibit her first male-portrait work which was shown in the VOCA 2010 Exhibition. Mitsuko Miwa received the VOCA Prize in 1995 after her graduation from Aichi Prefectural University of Fine Art and Music in 1981. She attended two artist-in- residence programs in Berlin and Stockholm respectively from 1996 to 1998. She has always been seeking for new expressions with particular motifs. This exhibition shows her work depicted from Andy Warhol’s statement “If you want to know all about Andy Warhol, just look at the surface of my paintings and films and me, and there I am. There's nothing behind it.” She will participate in a group exhibition at Kanagawa Modern Art Museum Hayama commencing from this December.